The ruins of Vijayanagara, located at present-day UNESCO World Heritage Site of Hampi, including the sixteenth-century Vitthala Temple, whose outer pillars reverberate musically when tapped with the fingers, can be viewed at the Immigration Museum in Melbourne until 26 January 2010. PLACE-Hampi is the world’s first interactive cultural exhibition, combining 3D stereographic panoramas, high quality sound recordings and custom-built computer software, that merges mythological and archaeological detail to give viewers the very real perception of walking amongst the ruins in India today. The exhibition premiered in Lille, France and drew maximum capacity crowds for 3 months. It has also been installed for 3 months in 2007 at the Martin Gropius Bau, in Berlin, at the ZKM in Karlsruhe, at Shanghai Science and Technology Museum, Shanghai and, at Science Centre in Singapore. There are a number of other planned installations in Europe. This is its first installation in Australia. Kenderdine first experimented with representing landscapes in 3D after being invited to work at Angkor in Cambodia in 2004, to produce a work for The Virtual Room at Melbourne Museum. She was then invited with Prof Jeffrey Shaw to make the work at Hampi, which was commissioned as an art work in celebration of France India Year in 2006. 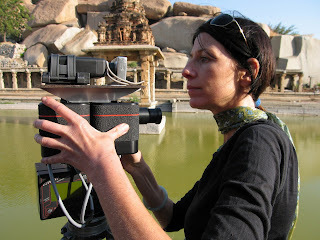 “Once we were introduced to Hampi, which is an utterly vibrant and extraordinary site with its fusion of pilgrimage community and archaeological and geological setting, we immediately felt that it was a great opportunity to explore our research ideas related to the post-cinematic experience of place,” says Kenderdine. At the centre of the large cylinder, which is the exhibition, is a motorised platform that allows the viewer to interactively rotate a projected image on screen and navigate a 3D environment of panoramic images of Hampi. A single-user interface allows viewers to control their forward, backward and rotational movements through the virtual scene, as well as the rotation of the image. Motion capture devices and software were used to digitally create the mythological Gods that viewers encounter in the exhibition. Another major challenge for Kenderdine and her team was to capture some of the living culture of the place. Hampi is no disused ruin stuck in the past—it is still a vibrant centre for pilgrims as it is believed to be the site of Kishkindha, the fabled Monkey Kingdom from the Ramayana. Gods and local deities inhabit the temples and landscape, and festivals and rituals attract thousands of believers. “Place-Hampi, through its animations, visualises intangible aspects of the landscape, those realms available to pilgrims who visit the site, whose religious beliefs animate that landscape. Place-Hampi, augments the visible elements with the mythological animation. It is a very modest attempt to make explicit this greater landscape,” says Kenderdine. So is virtual travel the future of tourism? “Place-Hampi provides an informed method of virtual travel that is rich with the processes of recording landscape common not only in archaeological practise but also in the artistic representation of place,” she says. Part of Kenderdine’s research interests also lies in the production of acoustic architectures of space in 3D—sound to match the visual production. “The power of acoustic “visualisation” is an emerging field of work within our understanding of space and place,” she says. Place-Hampi, will show at the Immigration Museum, Melbourne until 26 January 2010. For the avid traveller who likes heritage sites there is much pleasure to be gained by visiting PLACE-Hampi at the Immigration Museum in Melbourne. As to the philosophical question: is this the future of tourism? In my humble opinion, this is (in part) and it is much much more.. in what it exemplifies (aside the experience and insight it offers the museum goer) new media methods of presentation and interpretation of culture, humanities scholarship, and collaboration between archaeologists, academics and curators, using digital technologies in thoughtful, evocative and meaningful ways. A gentleman’s game? Not quite!